What Skills do you need to have to serve as an I.T. employee? We all thrive to choose the best career for ourselves by judging our potentials and capabilities. But do we ever get out of our comfort zone and place ourselves in endless tracks where each hurdle is a new learning? Information Technology or I.T. as we call it offers you a life with more than just tracks and hurdles; it shapes you for the best possible future! What is I.T. in the Headlines for over a decade? India has stepped in the new regime where “Make in India” is given importance over imports. So, every now and then a new company comes up with new products. These companies require man power to support and market their products. And who knows it better than our generation that every successful business these days works via websites and apps! Even the news we read in social media requires an I.T. professional for support and development! Who can become an I.T. Professional? Well Information Technology is that track which provides a career where even after getting recruited by a top company you need to continue with the learning process so that you don’t miss the place in the podium. Probably you need to become a “typical nerd” and love technology and machines more than midnight snacks. These days there are several sites which offer specialized courses on any I.T topic. Signing up for any of these courses any individual coming from any educational background can actually become a master with proper motivation and dedication. 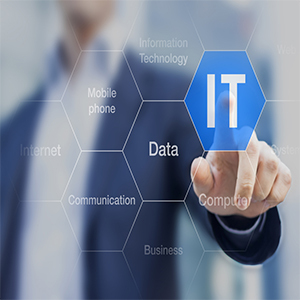 Organizations large and small depend heavily on specialized IT professionals who are skilled and well qualified as cloud computing, mobile applications, software, internet, social media, and cyber-security need more professionals for their growth and invincibility. What are the top I.T. jobs? There are more posts in the I.T. than words in a dictionary! Seriously, if you search thoroughly you could even come up with a new branch and start your own recruitment and build your business. For now we can have a look at the 5 topmost I.T. jobs that demand professionals. The days of storing data in personal computers is backdated! Using remote servers for storing, manage and process data is the new trend and so are the demand of cloud computing architectures. To work as a computer architecture you need to learn cloud computing. The components and subcomponents of cloud computing architecture consists of a front end platform, back end platforms, a cloud based delivery and a network. These components and subcomponents together make the cloud computing architecture. So, what are the skills you need to become a cloud computing architect? Through knowledge in at least one operating system (Linux, Unix, Solaris, Ubuntu, Windows). A good understanding and excellent working knowledge of networking, which includes TCP/IP, IP addresses, HTTP, DNS. And security is the most important part of cloud computing, so high-level understanding of key security concepts such as firewal is a must! To become an applications architect, you need become a software genius. Applications architecture is the key role in designing and analyzing software projects. From creating new applications to providing support to the existing ones, an application architect’s job venture varies at times. They also run software tests, develop product prototypes and create technical documents. And when needed they are also involved in providing programming and software development training to team members. Networking has always been a demanding subpart of information technology and computer network architects work with local area networks, wide area networks and intranets. And if you want to work as a computer network architect then you have to keep yourself technologically updated. You need have good knowledge of circuit boards, processors, chips, electronic equipment, computer hardware, software which includes applications and programming. If you want to become a computer architect, start studying! For working as mobile application developer, you need to have in-depth working knowledge of various platforms, from smartphones to tables. And of course operating a computer on different operating system platforms - Windows, Linux, Mac. You need to have an outgoing technical knowledge in programming languages such as C++, JAVA, HTML, MySQL, PHP, Objective-C, Wireless Networks. The mobile application development industry is ever growing and unsaturated. And moreover you could come up with your own application or even a game!